Adolph W. Gargolla was born circa 1903 at Wisconsin. Name Variation Gertrude Gargolla was also known as Gertruda. Gertrude Gargolla was born circa 1904 at Wisconsin. (?) Lyckberg was the son of (?) Lyckberg. Name Variation Albert Alan Hawkins was also known as A.
Albert Alan Hawkins married Eliza (?). Albert Alan Hawkins was born on 12 March 1806 at New York. He died on 17 June 1886 at age 80. [S249] U.S. Federal Census 1850 U.S. Federal Census, by Ancestry.com, Dwelling 123. [S248] U.S. Federal Census 1860 U.S. Federal Census, by Ancestry.com, Page 109. Dwelling 905. [S247] U.S. Federal Census 1870 U.S. Federal Census, by Ancestry.com, Dwelling 135. [S246] U.S. Federal Census 1880 U.S. Federal Census, by Ancestry.com, NA Film Number T9-1446 Page Number 293C. Name Variation Eliza (?) was also known as Curry. Eliza (?) married Albert Alan Hawkins. Eliza (?) was born circa May 1807 at Ireland. She died on 12 February 1877 at 69y 9m. Albert Hawkins was born in May 1845 at Vermont also reported as New York. He was the son of Albert Alan Hawkins and Eliza (?). Albert Hawkins married Katherine (?) circa 1876. Albert Hawkins died before 1920. [S245] U.S. Federal Census 1900 U.S. Federal Census, by Ancestry.com, ED130. Dwelling 262. [S244] U.S. Federal Census 1910 U.S. Federal Census, by Ancestry.com, ED111. Dwelling 94. Edwin Hawkins was born circa 1847 at Vermont. Name Variation Reinhart R. Breitzke was also known as Laurence. Name Variation Reinhart R. Breitzke was also known as Reinhart H.
Name Variation Reinhart R. Breitzke was also known as Reinhard. Reinhart R. Breitzke was born on 19 March 1907 at Ableman, Sauk, Wisconsin, also reported as 23 Mar 1907. He was the son of Gustave Julius Breitzke and Anna Sophia Dwars. Reinhart R. Breitzke was the best man at the wedding of Violet Anna Breitzke and Arthur William Friede in April 1926 at St John's Lutheran Church, Wisconsin; Violet Breizke and Arthur W Friede marriage announcement. Reinhart R. Breitzke died on 5 November 1989 at Dane, Wisconsin, at age 82. Reinhart R. Breitzke obtained US Social Security Card at Wisconsin; last residence Oregon, Dane, Wisconsin. [S373] U.S. Federal Census 1940 U.S. Federal Census, by Ancestry.com, Year: 1940; Census Place: Westport, Dane, Wisconsin; Roll: T627_4471; Page: 8A; Enumeration District: 13-105. Name Variation Reuben C. Breitzke was also known as Reuben. Reuben C. Breitzke was born on 8 October 1908 at Rock Springs, Sauk, Wisconsin. 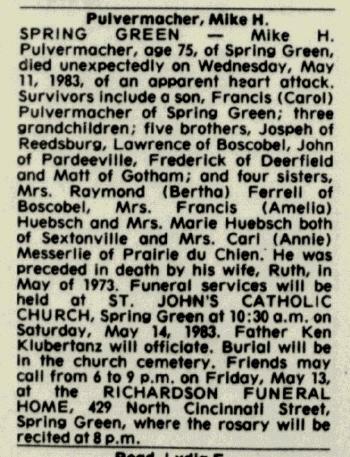 Reuben C. Breitzke died on 30 January 1971 at Dane, Wisconsin, at age 62 Reuben Breitzke obituary. [S373] U.S. Federal Census 1940 U.S. Federal Census, by Ancestry.com, Year: 1940; Census Place: Freedom, Sauk, Wisconsin; Roll: T627_4523; Page: 6A; Enumeration District: 56-15. Married Name 4 August 1956 As of 4 August 1956,her married name was Towery. Hazel Breitzke was born on 19 April 1916 at Wisconsin. She was the daughter of Gustave Julius Breitzke and Anna Sophia Dwars. Hazel Breitzke married Robert Lee Towery on 4 August 1956. Hazel Breitzke died on 25 April 1994 at Missouri at age 78. Hazel Breitzke graduated in 1932 at Class of 1932, Ableman, Sauk, Wisconsin. August William Breitzke was born on 4 July 1899 at Ableman, Sauk, Wisconsin. He was the son of Charles Daniel Breitzke and Ottilie Emilie Breitzke. 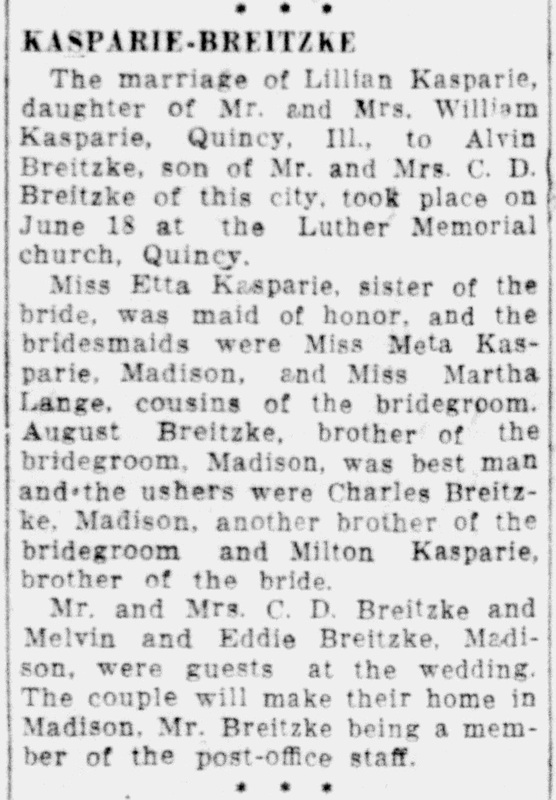 August William Breitzke was the best man at the wedding of Lillian T. Kasparie and Alvin William Breitzke on 18 June 1927 at Quincy, Adams, Illinois; Lillian Kasparie and Alvin Breitzke wedding announcement. August William Breitzke died in December 1981 at age 82. August William Breitzke obtained US Social Security Card at Wisconsin; last residence Madison, Dane, Wisconsin. [S244] U.S. Federal Census 1910 U.S. Federal Census, by Ancestry.com, ED71. Dwelling 158. [S243] U.S. Federal Census 1920 U.S. Federal Census, by Ancestry.com, ED 53.Dwelling 199. [S250] U.S. Federal Census 1930 U.S. Federal Census, by Ancestry.com, ED41. Dwelling 342. Name Variation Alvin William Breitzke was also known as A. W.
Alvin William Breitzke was born on 3 April 1903 at Ableman, Sauk, Wisconsin, also reported as 02 Apr 1903. Alvin William Breitzke married Lillian T. Kasparie, daughter of William Clement Kasparie and Lucinde Caroline Conradine Arendt, on 18 June 1927 at Quincy, Adams, Illinois, Lillian Kasparie and Alvin Breitzke wedding announcement. Alvin William Breitzke witnessed the burial of Frederick Herman Breitzke after 20 October 1936 at Greenmount Cemetery, Quincy, Adams, Illinois. Alvin William Breitzke died in September 1970 at age 67. He was buried in September 1970 at Mountain View Memorial Gardens, Mesa, Arizona. Alvin William Breitzke obtained US Social Security Card at Wisconsin; last residence Mesa, Maricopa, Arizona. In June 1933 at Sauk, Wisconsin, Mr and Mrs William Kasparie visiting Mr and Mrs Alvin Breitzke and Mrs Fred Mercer. In December 1933 at Wisconsin Mr and Mrs Alvin Breitzke entertained Mr and Mrs Fred Mercer and family. In November 1934 at Madison, Dane, Wisconsin, Alvin Breitzkes hosting Fred Mercers and C D Breitzkes for Thanksgiving. On 23 June 1935 at Mr and Mrs Alvin Breitzke and their daughers, Allena and Dolores, 1853 Jenifer st., are spending several days with relatives in Chicago.. In July 1939 Mr. and Mrs. Alvin Breitzke and their daughters Allene and Delores, 1431 Morrison st, returned recently from a two weeks' vacation spent at Moline, Ill., with Mrs. Breitzke's brother and his wife, Mr. and Mrs. Virgil Kasparie, and at Quincy with her parents, Mr. and Mrs. William Kasparie. 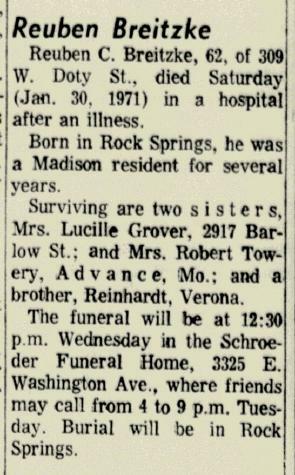 In July 1942 at Wisconsin Kenneth and Helen Kasparie were visiting his sister and brother-in-law, Lillian and Alvin Breitzke. The Kasparies were accompanied back to Quincy by their nieces, the Misses Allene and Dolores Breitzke. In July 1949 Mr and Mrs Alvin Breitzke, 1431 Morrison st, Mrs Evelyn Myers, 150 Division st, and Mrs Bertha Mercer, Spring Green, returned recently after a month's vacation trip through the West. Leaving by the northern route they visited the Bad lands and Black hills, Yellowstone National park, Salt Lake City, and Reno before reaching California where they visited Mrs Breitzke's brother and sister-in-law, Mr and Mrs E G Kasparie, Monrovia. Yosemite National park, the Red Woods, TiaJuana, the Grand canyon and the Petrified forest were included in the trip. 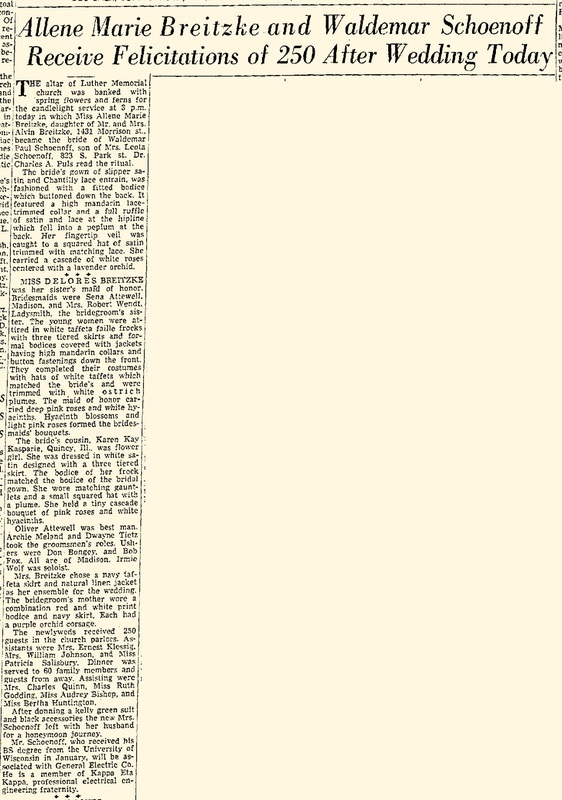 In Denver, Colo., they spent a week with Mrs Breitzke's brother and sister-in-law, Dr and Mrs L A Kasparie. [S250] U.S. Federal Census 1930 U.S. Federal Census, by Ancestry.com, ED41. Dwelling 364. Myrtle Breitzke was born on 28 January 1905 at Ableman, Sauk, Wisconsin. She was the daughter of Charles Daniel Breitzke and Ottilie Emilie Breitzke. Myrtle Breitzke died before 1910. Name Variation Charles Breitzke was also known as Charley. Charles Breitzke was born on 18 April 1907 at Madison, Dane, Wisconsin. 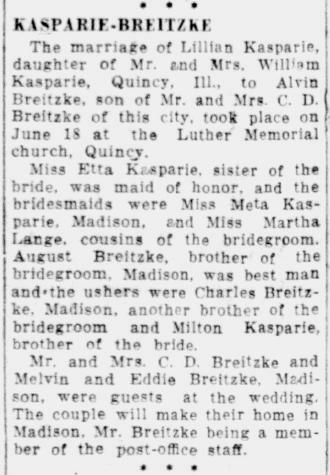 Charles Breitzke was an usher at the wedding of Lillian T. Kasparie and Alvin William Breitzke on 18 June 1927 at Quincy, Adams, Illinois; Lillian Kasparie and Alvin Breitzke wedding announcement. Melvin W. Breitzke married Elvira J. Taylor, daughter of F. B. Taylor. Melvin W. Breitzke was born on 3 September 1910 at South Dakota. Melvin W. Breitzke witnessed the marriage of Lillian T. Kasparie and Alvin William Breitzke on 18 June 1927 at Quincy, Adams, Illinois; Lillian Kasparie and Alvin Breitzke wedding announcement. Melvin W. Breitzke died on 6 March 1992 at Dane, Wisconsin, at age 81. Melvin W. Breitzke obtained US Social Security Card at Wisconsin; last residence not specified. Edward G. Breitzke was born on 10 December 1913 at South Dakota. Edward G. Breitzke witnessed the marriage of Lillian T. Kasparie and Alvin William Breitzke on 18 June 1927 at Quincy, Adams, Illinois; Lillian Kasparie and Alvin Breitzke wedding announcement. Edward G. Breitzke died on 2 May 1999 at age 85. Edward G. Breitzke obtained US Social Security Card at Wisconsin; last residence Colorado Springs, El Paso, Colorado. Name Variation Delores A. Breitzke was also known as Dolores. Married Name 30 August 1952 As of 30 August 1952,her married name was Tietz. Delores A. Breitzke was born on 12 May 1931 at Madison, Dane, Wisconsin. She was the daughter of Alvin William Breitzke and Lillian T. Kasparie. 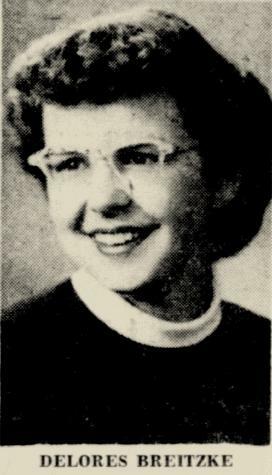 Delores A. Breitzke was the maid of honor at the wedding of Waldemar Paul Schoenoff and Allene Marie Breitzke on 11 February 1950; Allene Marie Breitzke and Waldemar Schoenoff marriage announcement. Delores A. Breitzke died on 23 October 2008 at age 77 Delores A. Tietz, age 77, died on Thursday, Oct. 23, 2008, at the HospiceCare Center, after a short battle with cancer. She was born on May 12, 1931, in Madison, to Alvin and Lillian Breitzke. Delores married Dawayne "Doc" Tietz on Aug. 30, 1952, at Luther Memorial Church, Madison. She was a member of Hope Lutheran Church, where she was active in their Cookie Walk and quilting. Delores enjoyed camping and traveling, spending the winter months in Arizona, and being with family. She was an avid Packers, Cubs and Badgers fan. Delores is survived by her husband, Dawayne "Doc"; three children, Cheryl (Jim) Hatfield, Gary (Sherry), and Cindy (Jim) Jorgensen; two grandchildren, Dan Tietz and Melissa Tietz; and her dog, Maggie. 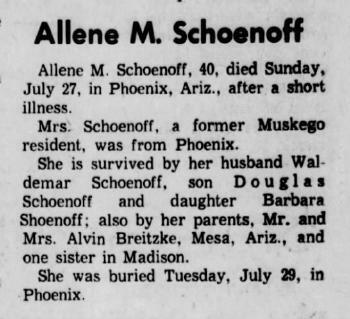 She was preceded in death by her parents; and a sister, Eileen (Breitzke) Schoenoff. Funeral services will be held at HOPE LUTHERAN CHURCH, 3702 County Trunk AB, McFarland, at 11 a.m. on Monday, Oct. 27, 2008, with the Rev. Chris Lee-Thompson presiding. Burial will follow at Highland Memory Gardens. Visitation will be held at GUNDERSON EAST FUNERAL HOME, 5203 Monona Drive from 3 p.m. until 5 p.m. on Sunday, Oct. 26, 2008, and at the church from 10 a.m. until the time of the service on Monday. In lieu of flowers, memorials may be made to HospiceCare Inc., 5395 E. Cheryl Parkway, Fitchburg, WI 53711. Gunderson East Funeral and Cremation Centers 5203 Monona Drive. 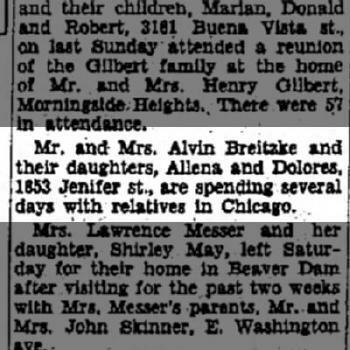 On 23 June 1935 at Mr and Mrs Alvin Breitzke and their daughers, Allena and Dolores, 1853 Jenifer st., are spending several days with relatives in Chicago.. In July 1939 Mr. and Mrs. Alvin Breitzke and their daughters Allene and Delores, 1431 Morrison st, returned recently from a two weeks' vacation spent at Moline, Ill., with Mrs. Breitzke's brother and his wife, Mr. and Mrs. Virgil Kasparie, and at Quincy with her parents, Mr. and Mrs. William Kasparie. In July 1942 at Wisconsin Kenneth and Helen Kasparie were visiting his sister and brother-in-law, Lillian and Alvin Breitzke. The Kasparies were accompanied back to Quincy by their nieces, the Misses Allene and Dolores Breitzke. Name Variation Allene Marie Breitzke was also known as Eileen. Name Variation Allene Marie Breitzke was also known as Allena. Married Name 11 February 1950 As of 11 February 1950,her married name was Schoenoff. Allene Marie Breitzke was born on 5 October 1928 at Wisconsin. Allene Marie Breitzke married Waldemar Paul Schoenoff on 11 February 1950 Allene Marie Breitzke and Waldemar Schoenoff marriage announcement. Allene Marie Breitzke died on 27 July 1969 at age 40. On 5 October 1929 Allene Marie Breitzke celebrates First birthday. Richard Louis Ferdinand Breitzke was born on 16 September 1903 at Ableman, Sauk, Wisconsin, also reported as 06 Sep 1903. He was the son of Henry J. G. Breitzke and Amelia (?). Richard Louis Ferdinand Breitzke married Marion B. (?) after 1940. Richard Louis Ferdinand Breitzke died on 17 November 1948 at Madison, Dane, Wisconsin, at age 45. [S244] U.S. Federal Census 1910 U.S. Federal Census, by Ancestry.com, ED113. Dwelling 183. [S243] U.S. Federal Census 1920 U.S. Federal Census, by Ancestry.com, ED152. Dwelling 204. [S250] U.S. Federal Census 1930 U.S. Federal Census, by Ancestry.com, Year: 1930; Census Place: Excelsior, Sauk, Wisconsin; Roll: 2609; Page: 4B; Enumeration District: 11; Image: 90.0. 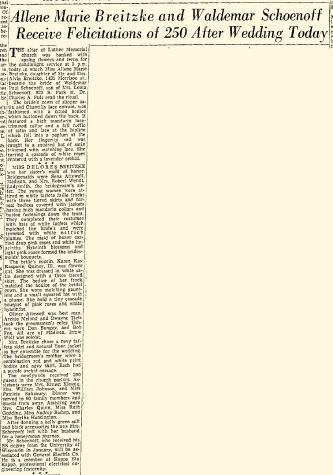 [S373] U.S. Federal Census 1940 U.S. Federal Census, by Ancestry.com, Year: 1940; Census Place: Excelsior, Sauk, Wisconsin; Roll: T627_4523; Page: 9B; Enumeration District: 56-12. Name Variation Patrick Loughney was also known as Laughney. Patrick Loughney married Ann D’Arcy. Married Name Her married name was Laughney. Married Name Her married name was Loughney. Name Variation Ann D’Arcy was also known as Darcy. Ann D’Arcy married Patrick Loughney. Married Name 1837 As of 1837,her married name was Loughney. Mary Moore married Roger Loughney, son of Patrick Loughney and Ann D’Arcy, in 1837. Mary Moore died circa 1839. John S. Pulvermacher married Leona (?). John S. Pulvermacher was born circa 1914 at Wisconsin. 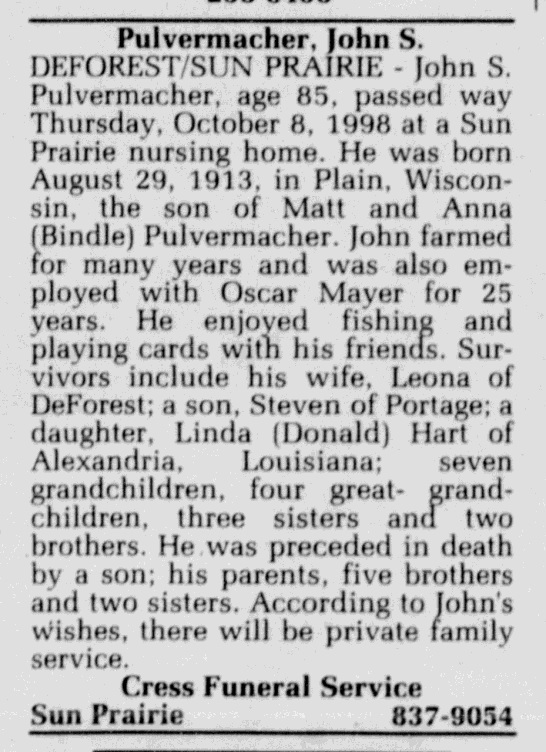 John S. Pulvermacher died on 8 October 1998 at Sun Prairie, Wisconsin, John S Pulvermacher obituary. Agnes Pulvermacher was born circa 1911 at Wisconsin. Agnes Pulvermacher died before 1989. Name Variation Michael H. Pulvermacher was also known as Mike H.
Michael H. Pulvermacher married Ruth (?). Michael H. Pulvermacher was born circa 1908 at Wisconsin. 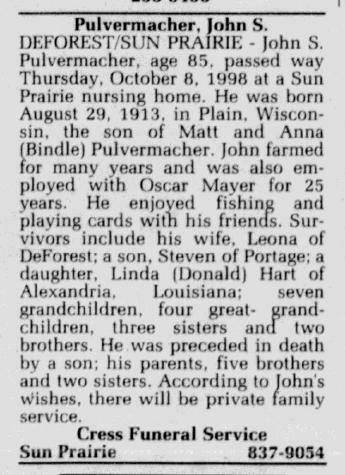 Michael H. Pulvermacher died on 11 May 1983 Michael (Mike) H Pulvermacher obituary. Name Variation Joseph M. Pulvermacher was also known as Joe. Joseph M. Pulvermacher was born on 28 January 1907 at Wisconsin. Joseph M. Pulvermacher married Inez L. Stoltz, daughter of Albert Stoltz and Alma Wheeler, on 22 November 1933. Joseph M. Pulvermacher died on 16 September 1991 at age 84. Joseph M. Pulvermacher obtained US Social Security Card at Wisconsin; last residence not specified. Name Variation William Harrison Clark was also known as Willie. William Harrison Clark was born on 4 January 1890 at Illinois. He was the son of Solomon Cornelius Clark and Martha Jane Kelley. William Harrison Clark married Selma B. Buls on 5 July 1911. William Harrison Clark married Bertha J. Larson, daughter of John M. Larson and Guri J. Rye, on 2 March 1918 his was listed as widower; her as maiden. William Harrison Clark and Bertha J. Larson were divorced before 1930. William Harrison Clark died on 22 August 1945 at age 55. In 1917 at World War I Draft Registration, Minnehaha, South Dakota, listed as widower with 2 children to support. [S245] U.S. Federal Census 1900 U.S. Federal Census, by Ancestry.com, ED255. Dwelling 197. [S244] U.S. Federal Census 1910 U.S. Federal Census, by Ancestry.com, ED324. Dwelling 117. [S243] U.S. Federal Census 1920 U.S. Federal Census, by Ancestry.com, ED183. Dwelling 320. 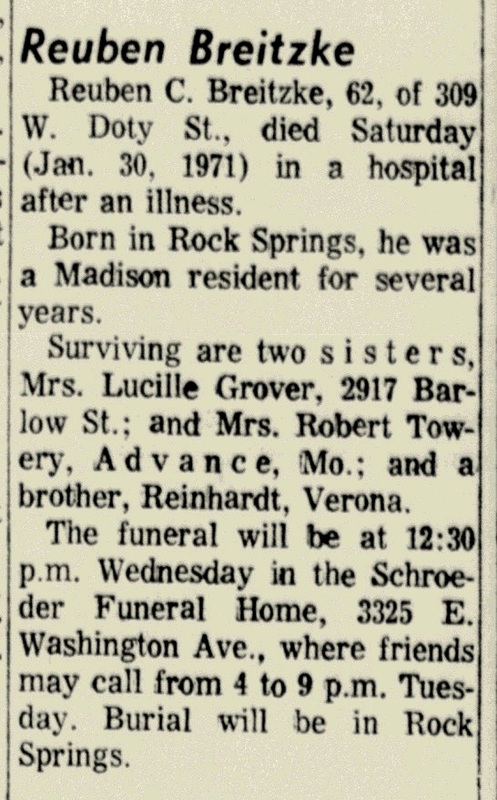 Everett Leroy Clark was born on 1 December 1918 at South Dakota also reported as 01 Dec 1917. He was the son of William Harrison Clark and Bertha J. Larson. Everett Leroy Clark died on 18 September 1951 at Kern, California, at age 32. Name Variation Casper H. Delange was also known as De Lange. Casper H. Delange was born on 14 February 1906 at Iowa. He married Bertha J. Larson, daughter of John M. Larson and Guri J. Rye, on 20 November 1933. Casper H. Delange died on 10 September 1967 at San Joaquin, California, at age 61. Name Variation Solomon Cornelius Clark was also known as S. Cornelius. Name Variation Solomon Cornelius Clark was also known as Cornelius. Solomon Cornelius Clark was born on 24 January 1851 at Illinois. He married Martha Jane Kelley, daughter of Thomas Benjamin Kelley and Elizabeth Jane Goodman, on 10 September 1874 at Jefferson, Illinois. Solomon Cornelius Clark died in September 1925 at Minnehaha, South Dakota, at age 74. [S246] U.S. Federal Census 1880 U.S. Federal Census, by Ancestry.com, Year: 1880; Census Place: Ewing, Franklin, Illinois; Roll: 207; Family History Film: 1254207; Page: 504B; Enumeration District: 14; Image: 0132.